Rugged hard drives give their users a sense of freedom. That is, freedom from keeping account of how many times they’ve dropped their hard drive. Freedom from worrying about their hard drive suddenly failing after too much wear and tear, taking with it hundreds of gigabytes of useful and, perhaps, crucial data. LaCie, a French manufacturer of USB flash drives and hard drives, has long built a name for itself regarding quality. For the most part, their products are known for a mix of elegance and a high level of durability. 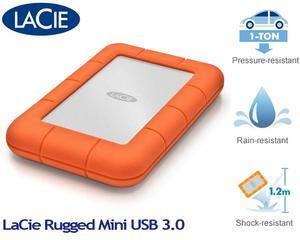 Their newest hard drive release, the LaCie Rugged Hard Drive USB 3.0, maintains the company’s standard, offering a hard drive in which you can safely store backup data or with which you can confidently transfer large files between devices. Just starting out with the hardware specifications gives you an idea of how well-designed and -crafted the Rugged Hard Drive USB 3.0 is. The casing is made of matte aluminum with a cut checkered pattern for grip and shock-resistance and is outfitted with anti-shock rubber to protect it from potential damage. If you feel like doubling up on the protection, the hard drive already comes with an orange sleeve made from shock-resistant rubber. While the LaCie Rugged Hard Drive is not meant to be the most rugged drive out in the market, it does a good enough job of being shock resistant up to 1000G. It can survive a drop from a maximum height of 2 meters, or about 6 feet and 6 inches. The hard drive also offers a range of connectivity that ensures fast data transfer. It has one USB 3.0 port and two FireWire 800 ports that are backwards compatible with USB 2.0 and FireWire 400, respectively. The data transfer speeds from those two interfaces are usually more than enough for the average user. You can get an average data transfer rate of 75 MB/s through the USB 3.0 port, for example, meaning that a 700MB would take only about 9 seconds to be transferred. 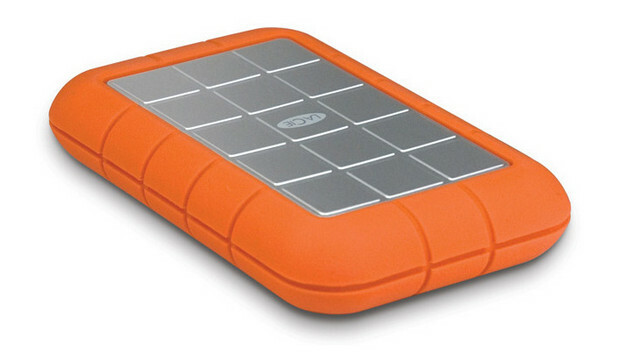 LaCie’s rugged hard drive protection just doesn’t stop at the hardware. The software features the company equipped its Rugged Hard Drive USB 3.0 may be even more valuable than the hardware specs. The LaCie Rugged comes with AES 256-bit encryption and password protection to keep your sensitive data secure. It’s possible to partition the drive into two and have a password-protected part thanks to the Private-Public software that’s bundled with the drive. LaCie even offers 10 GB of cloud storage for a year to keep secure copies of files online. If you are looking for one of the most secure products for your data, then the LaCie Rugged Hard Drive USB 3.0 should fit the bill. It comes in three kinds of storage capacity: 500 MB ($124.99), 500 MB [7200 rpm] ($134.99), and 1 TB ($179.99). This entry was posted in LaCie, LaCie Rugged HDDs, LaCie USB 3.0 Hard Drives and tagged LaCie, LaCie Rugged HDDs, LaCie USB 3.0 Hard Drive. Bookmark the permalink.